DAILYKENN.com -- Joe Brown Weaver is dead. The 47-year-old white man was fatally shot during a home invasion. Arrested are four black males: 22-year-old Polo Keoki Salazar, 21-year-old Muanah Aruna Fortune Jr., 20-year-old Elijah Quinlin Green and 25-year-old Devonte Trevon Major. The crime occurred in Somerville, South Carolina. Weaver's dog was also fatally shot during the break in. The crime was reported January 28, 2019 and was ignored by the national main-stream, far-left media. The murder of a white person by blacks does not fit the fictional television and movie narrative projected by Hollywood and is, therefore, ignored. It's lying by omission. Had a 47-year-old black man be fatally shot by four white male intruders, the story would have remained in the news cycle for months; perhaps years. Unprovoked white-on-black violence is extremely rare outside Hollywood sound studios. 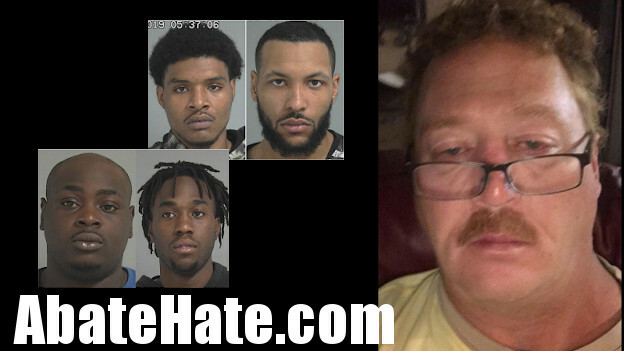 Unprovoked black-on-white violence is epidemic.